We all want to be safe in our communities. Our prison system is one strategy that as a society we use to try to meet that need. But is it as effective as it could be? In the US, we have a higher percentage of people in prison than any other country, and yet two out of three people who leave prison commit new crimes and are sent back to prison. Prison alone is not enough to create community safety. It appears that most prisoners return to our communities without having learned any better way to behave. This means that prison is only serving as a short-term solution–it is not meeting the long-term goal of creating safer communities. Our current prison system simply does not create change in most people who go through it, regardless of their crime. But what if there were effective, proven methods to change criminal behavior, and we used the time people have in prison to teach them? That is the premise of our program. We believe that repeat crimes could be prevented if prisoners were given enough help to change while they were in prison. We also believe that releasing prisoners with new skills and a pro-social mindset seeds change within their families and communities. Each time a parent is sent to prison it increases the chance of their children committing crimes that send them to prison. This cycle of harm can be stopped by helping people change while they are in prison with effective, proven methods. We help people change from criminals to community members. People learn how to live and meet their needs by watching others. Violence is learned and it can be unlearned and replaced with skillful, non-violent strategies. While it is not always easy to show others how to live more successfully, approaches that honor an individual’s humanity while holding them accountable for their acts have an excellent record at changing behavior. Nonviolent Communication (NVC) training has proven to be effective in supporting offenders to make different choices in their lives. NVC’s effectiveness is based on building empathy, a felt sense of self and others, and understanding of our deepest motivations and how to choose strategies that are more effective at meeting our needs. Research has shown that NVC training increases empathy, and has also shown that any increase in empathy increases pro-social behavior and decreases aggressive behavior, resulting in reduced violence and reduced violent crime. 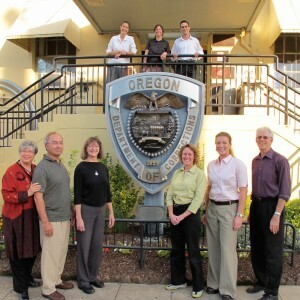 The Oregon Prison Project currently offers year-long trainings in five Oregon prisons and two post-release programs. Our programs have been so effective that the Oregon Parole Board is referring those who they deny parole to our program, and program graduates are more likely to get parole than those who do not attend our classes. As a sentence for their crimes some of our program participants received a sentence of life without possibility of parole. We are especially gratified that a number of these graduates have been found to be rehabilitatable and have received parole dates, demonstrating that even those making the most horrific mistakes can learn to live different lives. We feel deeply satisfied and gratified by these results, and even more encouraged by the stories that we are told by those who have been released from prison about how their new skills and understandings are affecting their lives. Most of all we are gratified that these people are not committing new crimes; they are contributing to others rather than harming others. This is the result we are all looking for. [Inmates] with NVC training are more self-aware, more emotionally mature, better able to articulate their change of heart and behavior, and show more responsibility for owning up to their actions with genuine regret.